Aim: The aim of this study is to estimate whole-body radiation dose to the radiopharmacist involved in labeling of three different 188Re-labeled compounds, namely, 188Re-Lipiodol, 188Re-tin colloid, and 188Re-hydroxyl-ethylidene-diphosphonate (HEDP) and to compare the occupational burden with the dose limits recommended by Atomic Energy Regulatory Board, India. Materials and Methods: The Department of Nuclear Medicine at Fortis Memorial Research Institute currently synthesizes three different Rhenium-188 labeled compounds, namely, 188Re-Lipiodol, 188Re-HEDP, and 188Re-tin colloid. To estimate the radiation exposure to the radiopharmacist involved in the synthesis, a survey meter was used to measure radiation level before the start of labeling procedure in the radiopharmacy by keeping it at the location where the radiopharmacist normally stands during preparation. Data were collected for 6 syntheses of each 188Re-Lipiodol, 4 for 188Re-HEDP, and 3 for 188Re-tin colloid followed by the quality control. The pocket dosimeter was used by the radiopharmacistat chest level, performing the labeling of 188Re-labeled compounds. All radiopharmaceuticals were synthesized by a single radiopharmacist. Results: 1850 MBq (50 mCi) 188W-188Re generator was eluted before the preparation of each radiopharmaceutical. The amount of 188ReO4- used for labeling with lipiodol/4-hexadecyl-1,2,9,9-tetramethyl-4,7-diaza-1,10-decanethiol, HEDP, and Tin colloid was in the range of 3182–4440 MBq (86–120 mCi), 2812–3774 MBq (76–102 mCi), and 962–1295 MBq (26–35 mCi), respectively. Meantime required to complete the synthesis was 95, 40, and 131.5 min, respectively. Mean whole-body effective dose received was 0.052, 0.009, and 0.004 mSv, respectively, as measured by using the pocket dosimeter. Conclusion: From this small study, we observed that the whole-body radiation dose to the radiopharmacist in radiolabeling and quality control of 188Re-labeled radiopharmaceuticals is within prescribed limits at the current synthesis frequency. 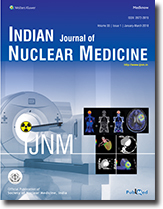 Aim: With increased clinical indications for positron-emission tomography/computed tomography (PET/CT) and repeated PET/CT scans, there is a need to reduce the radiation burden to the patient, professionals as well as public. This requires a redefining of the workflow and the 18-F-fluorodeoxyglucose (18F-FDG) administered activity. The objective of our study is to observe the impact of strike out reduction of administered activity on the radiation exposure to personnel and public, as well as the absorbed dose to the patient with no compromise on image quality by increasing the image acquisition time. Materials and Methods: Nineteen patients evaluated in this study (11 males, 8 females) were put into two groups, namely, A and B. Patients in Group A (n = 10) were administered with 18F-FDG equivalent to the recommended dose (7–8 MBq/kg body weight) whereas patients in Group B (n = 9) were administered with 18F-FDG equivalent to half the recommended dose (3–4MBq/kg body weight). The exposure rates from the patients at the body surface and 100 cm distance were measured immediately and 1 h postinjection. Results: The average surface dose rate and 100 cm dose rate of the adult patients immediately postinjection for patients of Group A were 0.94 ± 0.19 mSv/h and 0.057 ± 0.007 mSv/h, and for Group B were 0.34 ± 0.24 mSv/h and 0.031 ± 0.01 mSv/h. Conclusion: This study suggests that reduction in injected 18F-FDG activity reduces the radiation exposure rate from the patient, absorbed dose to the patient with reportable image quality. Purpose: Despite therapeutic effects of radioiodine in patients with differentiated thyroid cancer, there are some disadvantages due to harmful radiation to other tissues. According to the current guidelines, patients are recommended to drink lots of water and frequent voiding to reduce the amount of 131I in the body. This study was designed to assess the impact of the amount of liquid intake on reduction of the measured dose rate of radioiodine-treated patients. Materials and Methods: A total of 42 patients with differentiated thyroid cancer without metastasis who had undergone total thyroidectomy and had been treated with radioiodine were selected. The patients were divided into two groups according to the amount of their fluid intake which was measured during the first 48 h after 131I administration. In all patients, the dose rate was measured immediately and 48 h after iodine administration. Results: Each group included 21 patients. Dose rate ratio (the ratio of the second dose rate to the first dose rate) and dose rate difference ratio (the ratio of the difference between the two measured dose rates to the first dose rate) were calculated for each patient. Despite the significant difference in the amount of the liquid drunk, no statistically significant difference was seen between the different groups in parameters of dose-rate ratio and dose-rate difference ratio. Conclusion: Higher fluid intake (>60 ml/h in our study) alone would not effectively reduce the patient's radiation dose rate at least not more than a well-hydrated state. It seems that other interfering factors in the thyroidectomized patients may also have some impacts on this physiologic process. Background: Phase analysis can be easily performed by different software to assess the left ventricular dyssynchrony from gated single-photon emission computed tomography (SPECT) myocardial perfusion imaging (MPI) with high precision. However, the normal values of histogram bandwidth (HBW) and phase standard deviation (PSD) and their comparison using different programs have not been fully elucidated and actively being evaluated at present. The aim of this study was to determine the phase analysis parameters values and to compare the phase indices of two commonly used programs in a group of patients with normal gated SPECT-MPI. Methods: Phase parameters were retrospectively evaluated in 138 consecutive nondiabetic patients having a normal gated SPECT-MPI using the quantitative gated SPECT (QGS) and Emory Cardiac Toolbox (ECTb) software. 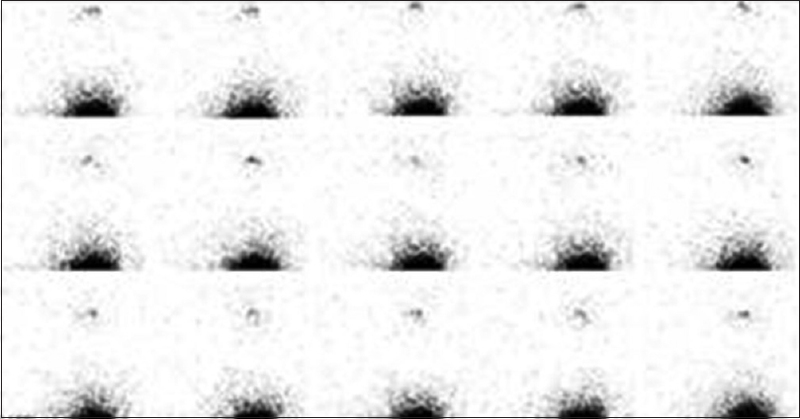 HBW, PSD, and phase entropy were calculated separately using both programs. Results: The fair correlation between software programs was observed. HBW and PSD in QGS and ECTb were 26.20 ± 9.7 and 25.46 ± 8.0 (r-value. 56, SEE 6.65) and 6.64 ± 2.5 and 7.65 ± 2.5 (r = 0.54, SEE 2.14), respectively. The value of phase entropy in QGS program was 45.08 ± 6.3. A fair correlation between phase entropy and PSD in QGS was observed (r = 0.44, 95% confidence interval-0.29–0.56). Conclusion: Phase analysis parameters derived from gated SPECT-MPI in patients with normal myocardial perfusion are program dependent and may differ. The results cannot be interchangeably used in the same patients. Purpose: Iodine-131 is used as a radiopharmaceutical to treat thyroid cancer. 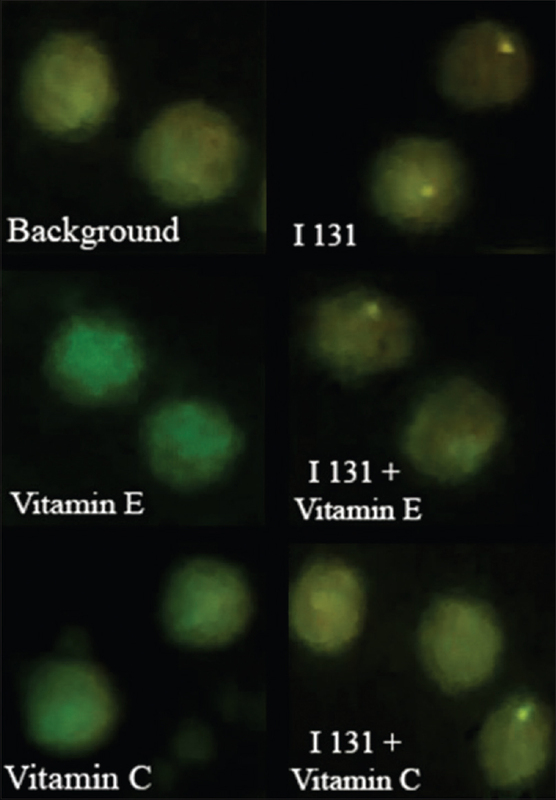 The current study aimed to evaluate the effects of vitamins E and C on the level of DNA double-strand breaks (DSBs) caused by Radioiodine-131 (I-131) in human lymphocytes. Materials and Methods: Whole blood samples from human volunteers were incubated with a certain concentration of vitamins. After 1-h incubation, the samples were incubated with 20 μCi I-131/2 mL (blood + NaCl) for 1 h. To evaluate the effects of antioxidants, lymphocytes were separated, and the mean DSBs/cell was measured for each sample through γ-H2AX assay. Results: After 1-h incubation with 20 μCi I-131/2 mL (blood + NaCl), iodine-131 increased the level of DSBs by 102.9%, compared with the background group. Vitamins E and C reduced the level of DSBs by 21.5% and 36.4%, respectively. Conclusion: Using vitamins E and C as antioxidants can reduce the toxicity of I-131. Furthermore, vitamin C provided the more protection for DNA, compared with vitamin E.
Purpose of Study: The purpose is to evaluate the findings and utility of esophageal transit scintigraphy (ETS) and gastroesophageal reflux scintigraphy (GES) in patients presenting with upper respiratory tract (URT) symptoms suspected to be due to gastroesophageal reflux (GER) disease. Materials and Methods: Thirty patients aged between 19 and 60 years underwent nasopharyngolaryngoscopy (NPL), ETS, and GES. Correlation between GER, esophageal motility, and NPL was evaluated. Inclusion criteria include patients with recurrent URT symptoms such as chronic dry cough/hoarseness of voice and itching/foreign body sensation in throat. Those with typical gastrointestinal (GI) symptoms of GER, URT symptoms relieved by antibiotics, surgical intervention in abdomen, cardiac/hepatobiliary diseases, etc. were excluded from the study. Results: Significant correlation was found between GER and NPL in 28/30 patients. More the grade of reflux, more severe was the NPL findings. Two patients with Grade II reflux had normal NPL suggesting structural inflammatory changes due to acidic pH of refluxate which have not yet manifested or symptoms could be due to nonacid refluxate. Incidence of esophageal motility disorder was statistically significant in patients with GER disease (GERD). Patients who had symptoms, but no demonstrable GER showed delayed ET in supine position suggesting the presence of esophageal motility disorder even before GERD. Conclusion: GES demonstrated GER in patients presenting with URT symptoms without typical GI symptoms. ETS showed coexistence of esophageal motility disorder in most patients presenting with URT symptoms even without an associated reflux disease. We hypothesize that primary abnormal esophageal motility leads to delayed esophageal clearance and consequently to URT symptoms. Addition of ETS to GES is easily feasible with no significant additional cost, time, or radiation burden. Purpose: Ischemic cardiomyopathy (ICM) and non-ICM (NICM) causes of dilated cardiomyopathy with similar clinical presentation have different management and prognosis. This study employed myocardial perfusion imaging (MPI) to differentiate between the two using quantitative parameters in Indian population. Methods and Materials: Fifty patients prospectively underwent MPI and 18F-fluorodeoxyglucose metabolism studies. P values (0.05 as significant) were calculated for the left ventricular ejection fraction (EF), end diastolic volume (EDV) at rest and stress, end systolic volume (ESV) at rest and stress, summed rest score (SRS), summed difference score (SDS), and eccentricity. On 6-month follow-up, rate of hospital admission, change in management and death was correlated for ICM and NICM. Coronary angiography (CAG) being gold standard, sensitivity, specificity, positive predictive value (PPV), negative predictive value (NPV), and level of agreement were calculated for MPI. Results: MPI and CAG had a moderate level of agreement (κ = 0.463) for differentiating ICM and NICM. The sensitivity, specificity, PPV, NPV, and diagnostic accuracy were 79.31%, 66.67%, 76.67%, 70.0%, and 74% for ICM and 66.67%, 79.31%, 70%, 76.67%, and 74% for NICM, respectively. Significant differences were seen in EDV stress (P = 0.045), EDV rest (P = 0.031), ESV rest (P = 0.034), SRS (P = 0.004), Left ventricular EF rest (P = 0.049) and SDS in ICM and NICM, respectively. Conclusion: EDV at rest and stress, ESV at rest, SRS, SDS, and EF at rest obtained using MPI provides precise quantitative information to differentiate ICM and NICM. It is wide and easy availability, noninvasiveness, objectivity, and near absence of complications favors it as a preferable diagnostic tool with its given sensitivity, specificity, and accuracy for the purpose. Introduction: Hydronephrosis (HDN) in adults is a common presentation and may be due to congenital ureteropelvic junction obstruction. Diuresis renography is the method of choice for differentiating a dilated unobstructed urinary system from a true obstruction. The aim of this study was to compare the F+20 protocol with F-15 protocol and see whether this new protocol can reduce inconclusive results. Materials and Methods: It was a prospective, comparative study included 51 adult patients of primary HDN. Each patient underwent both F+20 and F-15 diuretic Technetium-99m diethylenetriaminepentacetate (Tc-DTPA) renography protocol studies. The results of diuretic Tc-DTPA renography studied in terms of obstructive, nonobstructive, or equivocal. Results: A total 60 renal units (RU) with HDN were included in this study. The mean age of patients was 25.25 years. 36 RU presented with specific symptoms and 24 RU with vague symptoms or diagnosed incidentally. The equivocal results were significantly lower in F-15 protocol than F+20 protocol. The equivocal results in F+20 protocol were significantly higher with incidentally diagnosed HDN and patients presented with vague symptoms. Most of the equivocal results of F+20 protocol were converted into either obstructive or nonobstructive by the F-15 protocol. Conclusion: The F-15 diuretic renogram protocol was associated with significantly less equivocal results than F+20 protocol. Moreover, F-15 protocol allowed clarification in cases of equivocal results of F+20 protocol. Therefore, we suggest the F-15 diuresis protocol as a single test for confirmation or exclusion of obstruction especially in the adult patient of HDN presented with vague symptoms or diagnosed incidentally. Context: Instillation or application of the radiotracer over the tear film is one of the important parts of dacroscintigraphy. Our study explains the value of an improvised dropper technique so that desired amount of radioactivity in desired volume can be instilled over the tear film. Aim: The aim of the study is to introduce a simple and convenient instillation method based on dropper technique for performing dacroscintigraphy. This improvised dropper technique can be used so that desired amount of radioactivity in desired volume can be instilled over the tear film. The objectives of this experiment are to measure the volume and activity of each drop from the dropper. Settings and Design: Experiment of volume and activity measurement standardization was carried out in two parts. In the first part, we calculated the volume of each drop indirectly to standardize the volume of drop. In the second part, we standardized the activity in each drop by measuring it in a dose calibrator. 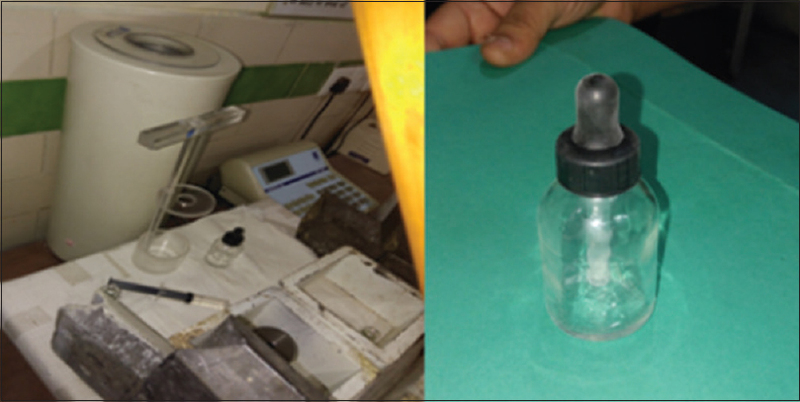 Subjects and Methods: In this study, we used a common pediatric dropper of approximately 1 ml capacity, radioactivity (99mTcO4 pertechnetate), sample vial (container), vial holder, a pair of nonsterile gloves, dose calibrator, etc., Experiments of volume and radioactivity standardization were carried out in two parts. The first part of experiment calculated volume of each drop indirectly, and in the second, we standardized the activity in each drop by measuring it in dose calibrator. 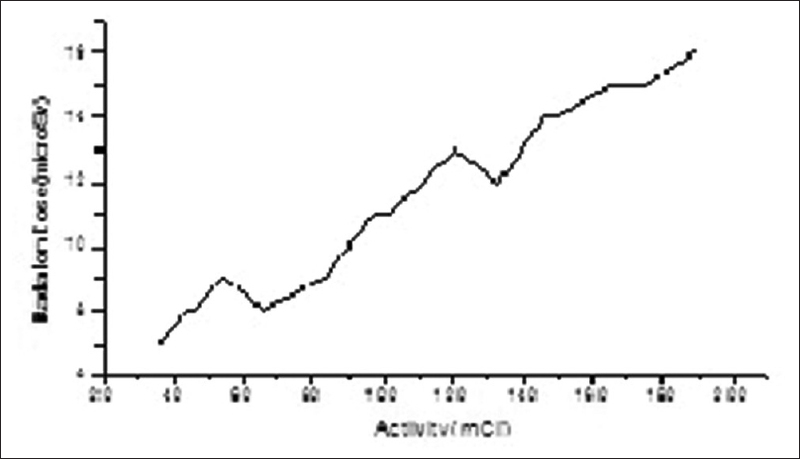 Statistical analysis used: Analysis of variance test was used to calculate the correlation of readings by same individual as well as among the three individuals Results: After analysis of result obtained, it was understood that there was no significant difference found in volume and activity of each drop in the readings recorded by same individual as well as among the three individuals. The calculated activity and observed activity were 86.64 and 79.16 μCi, respectively. The difference was only 8.63% lying within acceptable limits. 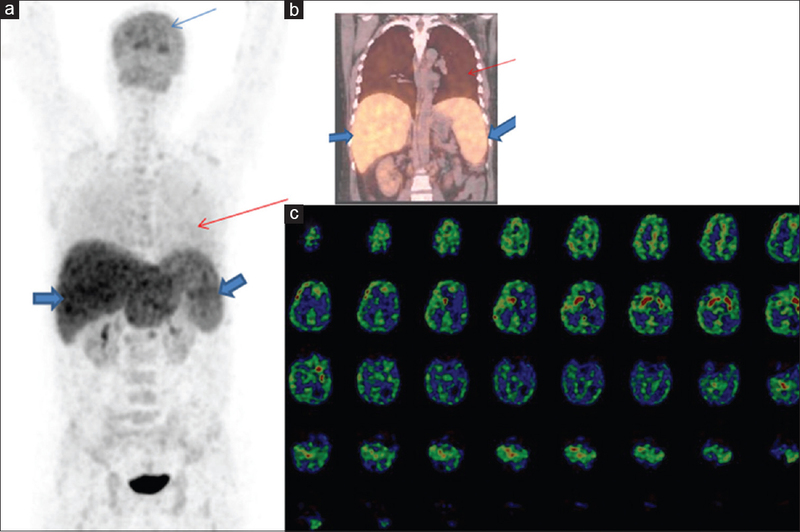 18F-fluorodeoxyglucose positron emission tomography-computed tomography (18F-FDG PET-CT) is a rapidly evolving hybrid imaging technique in evaluation of infection and inflammation. Usually, functional changes often precede anatomical changes. 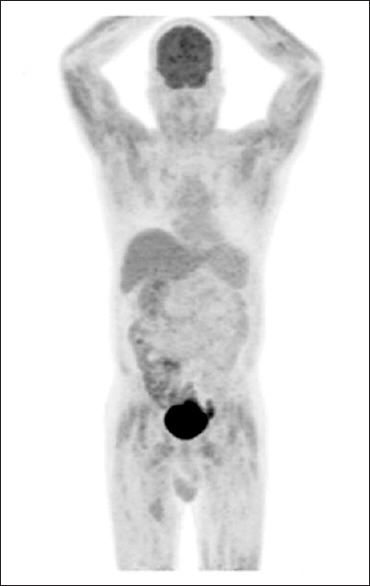 18F-FDG PET-CT, a noninvasive diagnostic test and it is useful for the early detection of inflammation. Most of the large vessel vasculitis patients present with nonspecific signs and symptoms, which are difficult to diagnose clinically. 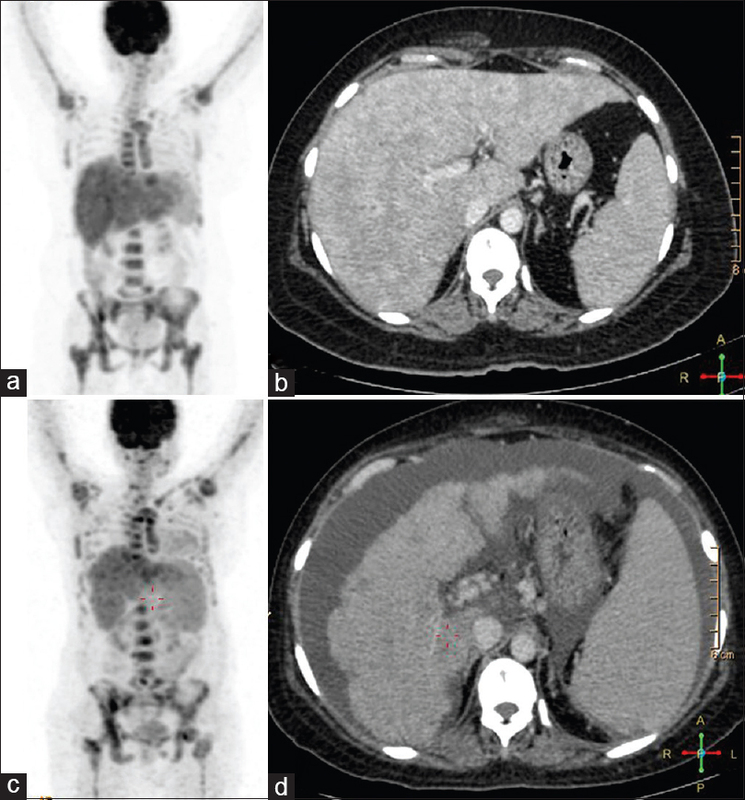 Here, we discuss three cases of large vessel vasculitis with different clinical presentations, identified by 18F-FDG PET-CT scan. Adenoid cystic carcinoma (ACC) of sinonasal cavity is not the frequent entity. It is characterized by indolent growth and clinical course and high rate of recurrences, perineural spread, and late metastases. We represent a patient with rare renal metastasis from sinonasal ACC in pretreatment fluorodeoxyglucose positron emission tomography-computed tomography scan, and pathological confirmation has been obtained from both the primary and metastatic sites. Metastatic lesion was asymptomatic and found during the early course of disease. As per our knowledge, this is the second case report of sinonasal ACC with renal metastasis and the first case of metastatic ACC in patient prior receiving any type treatment. Testicular adrenal rest tumors (TARTs) are secondary to hypertrophy of adrenal rest cells in the rete testis in settings of hypersecretion of androgens. We present a case of congenital adrenal hyperplasia with TART with clues to the diagnosis on 18F-fluorodeoxyglucose positron emission tomography/computed tomography (18F-FDG PET/CT). 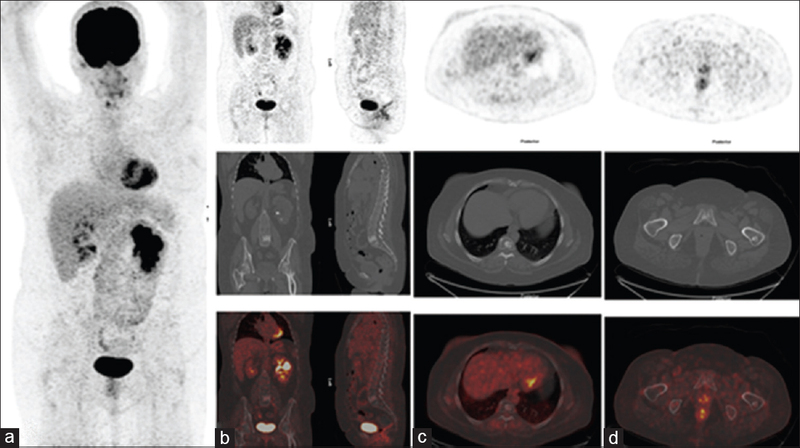 To the best of our knowledge, this is the first reported case on the role of 18F-FDG PET/CT in TART. 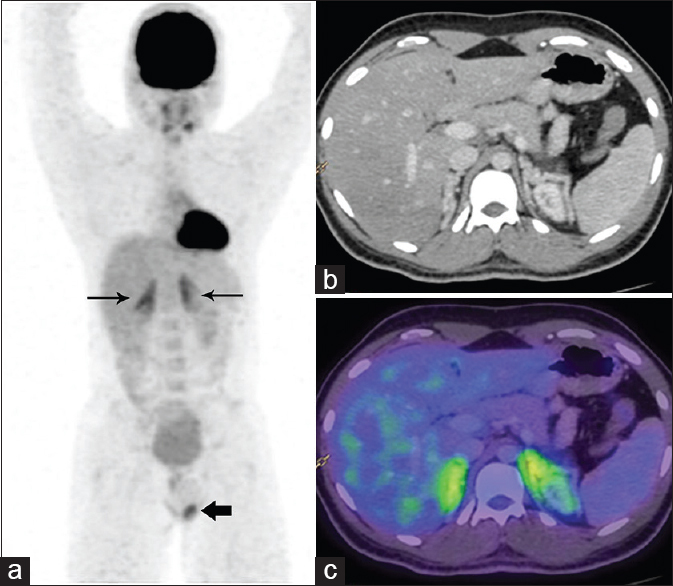 Gallium-68 prostate-specific membrane antigen positron emission tomography/computed tomography (Ga-68 PSMA PET/CT) is a promising diagnostic tool for patients with prostate cancer. Penile metastasis from prostate cancer is a rare phenomenon that infrequently manifests as malignant priapism. 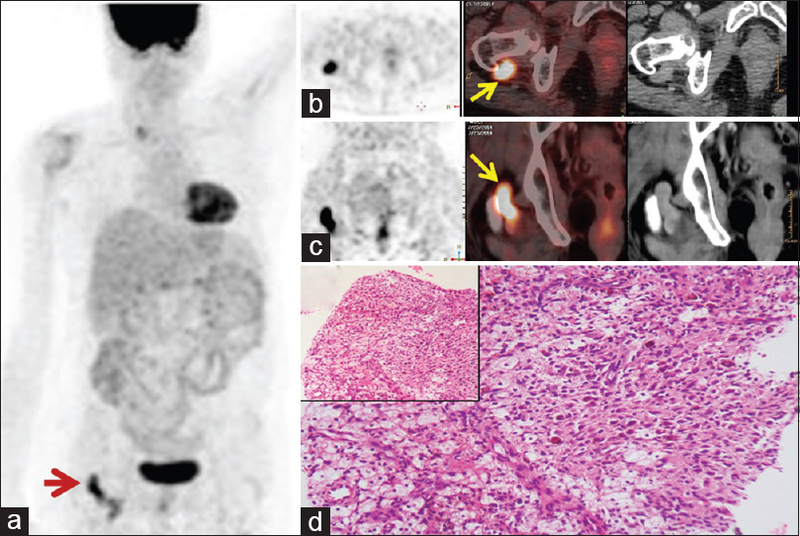 We present a case of 79-year-old patient diagnosed as a case of adenocarcinoma prostate presenting with penile metastases imaged using Ga-68 PSMA PET/CT. Thyroid papillary microcarcinomas (PMCs) usually follow a very benign clinical course and are rarely metastatic. Any case of PMC presenting with distant metastases without any rising thyroglobulin level should be suspected to have any other primary apart from the thyroid and a meticulous clinical and diagnostic approach should be considered to identify the second primary. We hereby present a case of 52-year-old female treated as PMC with metastatic liver lesion, which was initially thought to be of thyroidal origin. Later, it was diagnosed as a metastatic neuroendocrine tumor of unknown primary. Idiopathic inflammatory myositis is characterized by rapidly progressive, symmetric weakness of the muscles that produce severe disability. In the majority of these patients, myositis appears to be a paraneoplastic feature associated with cancer. 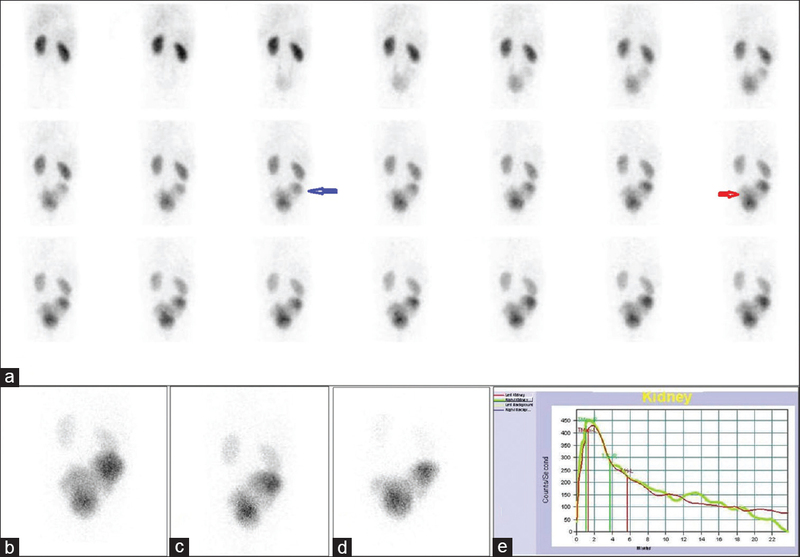 Fluorodeoxyglucose positron emission tomography-computed tomography has been increasingly used in the detection and evaluation of occult malignancy responsible for the paraneoplastic syndromes. We report the case of a 59-year-old male patient suffering from locked-in syndrome (LIS) following basilar artery thrombosis despite an attempt of thrombolysis. Neurological examination showed quadriplegia and aphonia and a state of coma requiring mechanical ventilation was diagnosed. 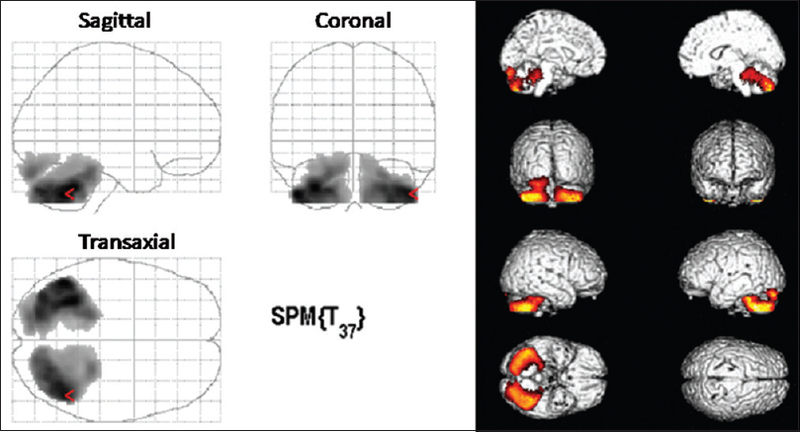 The use of 18F-fluorodeoxyglucose (18F-FDG)-positron emission tomography (PET) allowed to detect a normal 18F-FDG uptake in the main cerebral cortical areas and a significant reduction of 18F-FDG uptake in both cerebellar hemispheres, compatible with a functional deafferentation, helping confirming the clinical suspicion of LIS. The diagnosis of LIS, according to literature, is based on the clinical assessment and the utilization of scores as the Coma Recovery Scale-Revised. The standard neuroimaging techniques, although recognize the site of injury, are not able to differentiate the different conditions affecting a state of altered consciousness. Performing 18F-FDG-PET in patients with LIS might help addressing the correct diagnosis and prompting subsequent appropriate treatment, and therefore, ultimately improving the patient outcome. Therefore, 18F-FDG-PET should be taken into account in the early clinical assessment of doubtful cases. 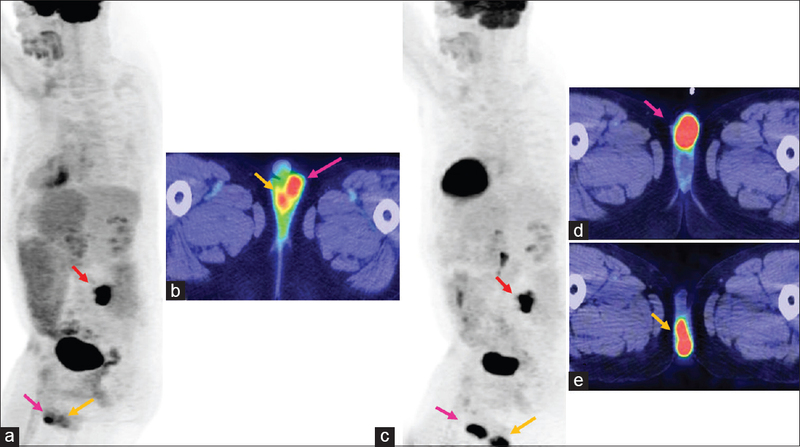 A 71-year-old male patient with urothelial carcinoma of the bladder was referred for 99mTc-methylene diphosphonate bone scintigraphy to assess for skeletal metastasis. While the bone scan showed no abnormal skeletal uptake, tracer activity was detected in the extrarenal region of the left renal fossa on the planar image; single photon emission computed tomography-computed tomography (CT) demonstrated tracer pooling in the perirenal collection. 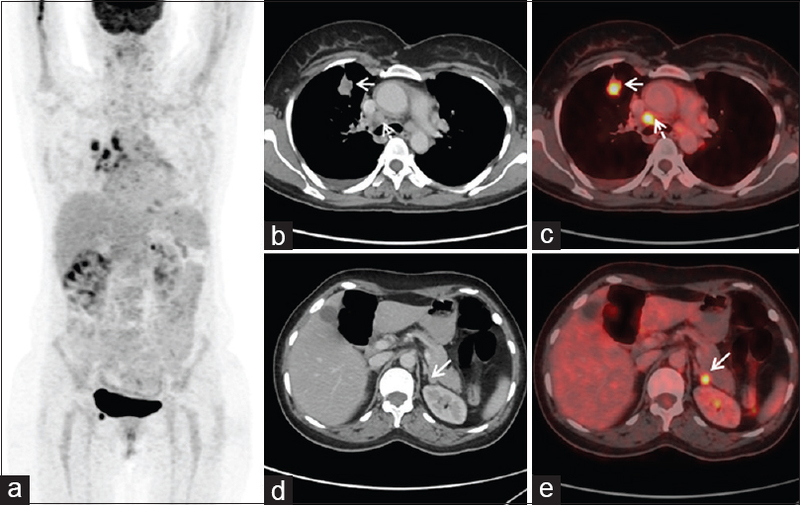 In addition, the CT detected nontracer-avid parenchymal lung nodules and hypodense liver lesions consistent with metastatic disease. The perinephric urinary leak was drained by percutaneous drainage, confirmed by diuretic renography the following day. Testicular metastasis from gastroesophageal junction (GEJ) adenocarcinoma is a very rare condition. 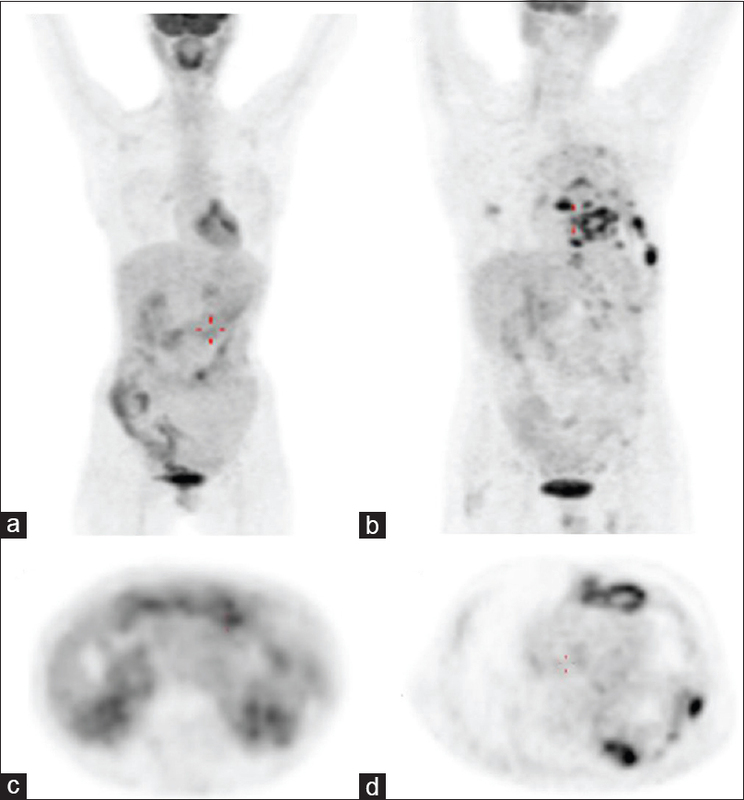 A 57-year-old male with a history of neoadjuvant chemotherapy and surgery for HER-2-positive GEJ adenocarcinoma underwent a follow-up 18F-fluorodeoxyglucose positron emission tomography/computed tomography (PET/CT). It revealed multiple metastases including bilateral testicular and L4 laminar metastasis. 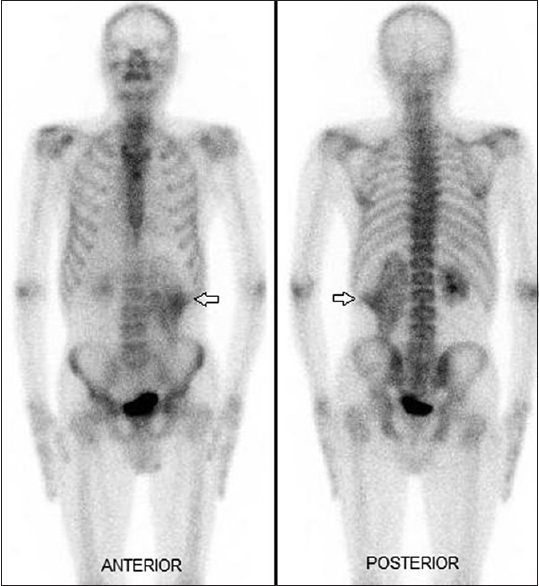 The patient received multiple chemotherapies, but follow-up PET/CT showed interval progression of disease. 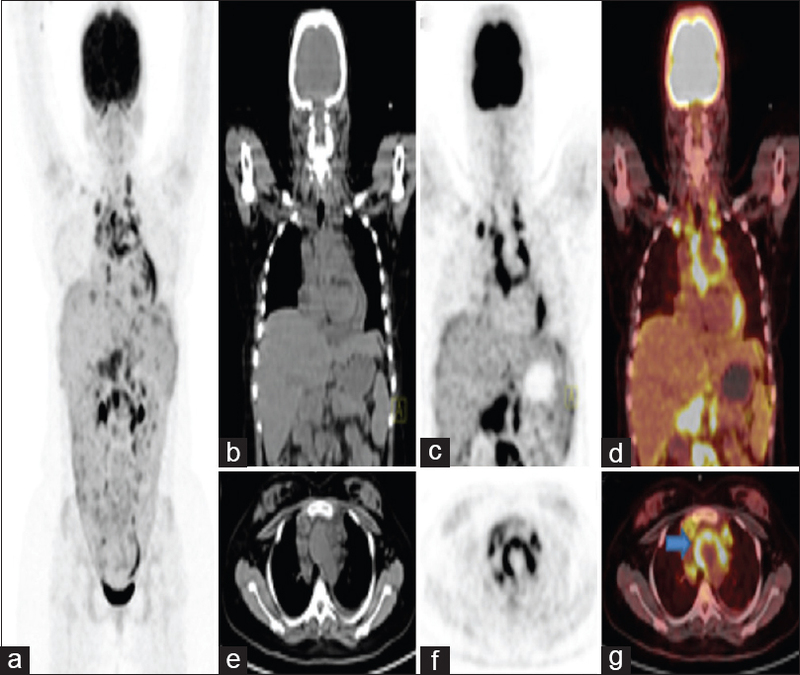 Here, we present a case highlighting one of the unusual sites of metastasis from GEJ cancer, role of PET/CT as a surveillance tool in such patients, and the importance of radiologists to be aware of such uncommon sites of metastasis to avoid interpretative errors. Human immunodeficiency virus (HIV)-related dementia is the most severe form of neurocognitive disorder in patients with AIDS. It is relatively uncommon in postantiretroviral therapy (HAART) era and is associated with a high cerebrospinal fluid CSF/plasma viral load. 18F-fluorodeoxyglucose positron emission tomography/computed tomography (18F-FDG PET/CT) has proven useful in malignancies, infections, and central nervous system lesions in HIV-infected patients and has been used to explore regional cerebral glucose metabolism patterns in HIV-positive patients with and without cognitive impairment. We present the case of a 36-year-old male with AIDS presenting as pyrexia of unknown origin, where global brain hypometabolism was noted incidentally on FDG PET/CT referred for identification of the infective focus/tumor causing the fever. Crow-Fukase syndrome (POEMS syndrome) is a rare systemic paraneoplastic syndrome. Bone lesions are manifested by sclerotic osteoblastic lesions often associated with bone pain. Characterization of osseous lesions is always crucial for clinical correlation and better patient management. 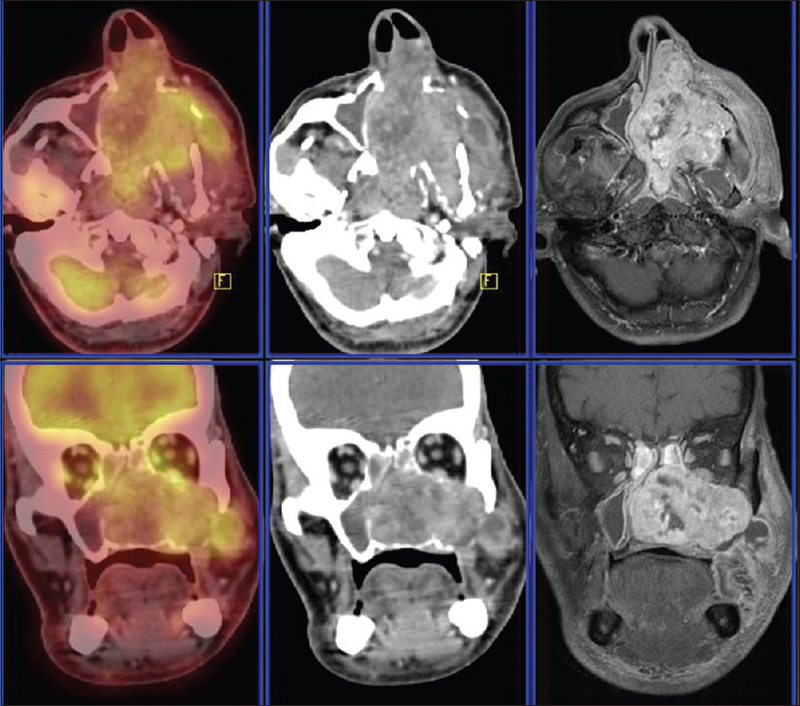 We present a case where 18F-fluorodeoxyglucose positron emission tomography (18F-FDG PET/CT) was unable to characterize a clinically symptomatic patient, and 18F-fluoride PET/CT showed excellent characterization of osteosclerotic lesions. The results were in correlation with already published data and showed that 18F-fluoride PET/CT has better uptake in osteoblastic lesions in POEMS syndrome when compared to18F-FDG PET/CT and have superior imaging quality in assessing the bone lesions. 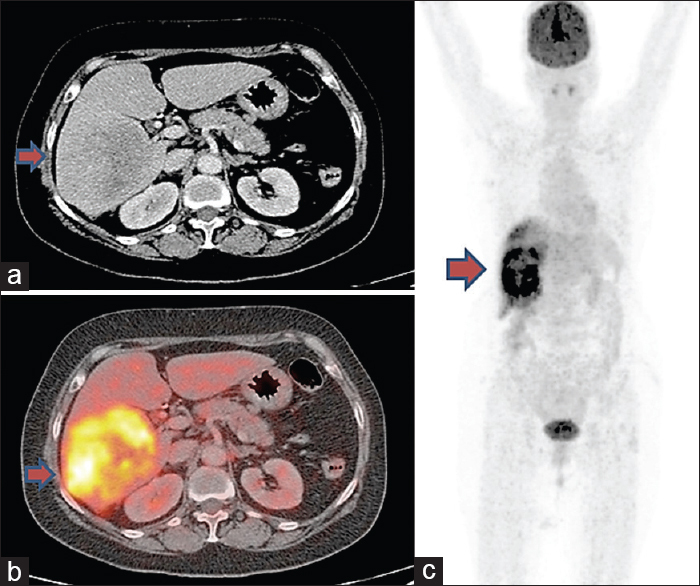 The complementary anatomical and functional information provided by hybrid imaging with single-photon emission computed tomography-CT (SPECT-CT) is a very useful imaging tool in selected cases where anatomical information is lacking as in the scenario of dynamic renal scintigraphy. The authors present a case of a 5-year-old male child with symptoms suggestive of cutis laxa with urinary tract infection. The child underwent dynamic renal scintigraphy with Tc99m ethylene dicysteine for cortical function and drainage assessment. Hybrid SPECT/CT proved valuable in the child in identification of the bilateral gross urinary bladder diverticulae.